The Sixers drafted four players last year. Will they keep all five of their picks this year? The entire concept of "The Process" was built on acquiring assets, and turning them into better assets. Whether it is getting a random first round pick thrown into a trade (like the 10th pick in this year's NBA Draft turned out to be), or turning the No. 3 overall pick into Joel Embiid (like Philly did in 2014), or stockpiling five total draft picks (like the Sixers have right now), Philadelphia has a lot of moves it can make. Which means this is where we pause to mention Sam Hinkie's name and thank him for the gifts he has bestowed upon us. The Sixers have the cap space to make a big swing in free agency, the players under contract to make blockbuster trades and the draft capital to potentially move up or down in June's event. With the 10th and 26th picks in the first round (as well as three second rounders) and a roster with a bevy of pieces to compete for championships in the not-too-distant future, maybe it makes sense to package 10 and 26 to move up and get a better player in the first round. 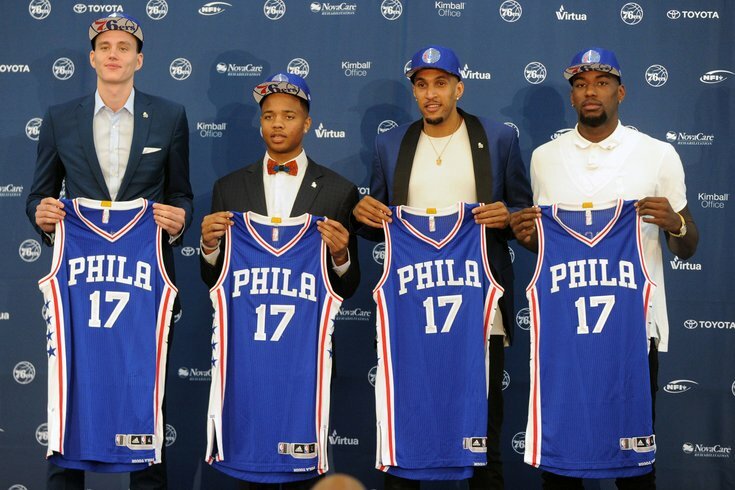 The Sixers don't really need five rookies next year, so something has to give. Based solely on feasibility, a trade up could potentially get the Sixers into the 5-through-8 range. Which means they'd need a willing partner in the Cavaliers (8th), Bulls (7th), Magic (6th) or Mavericks (5th). Whether that is realistic is yet to be seen, but for teams much further behind on rebuilding that Philadelphia is, getting two first rounders could be appealing. The quality of player is also potentially higher if they can slot themselves closer to the top 5. Michael Porter Jr., Trae Young, Mohammad Bomba – or even Jaren Jackson – could be targets if the Sixers can find a way to move up, instead of their likely No. 10 overall landing spots like Mikal Bridges, Wendell Carter Jr. or Lonnie Walker IV. The former may be more desirable than the latter for a team interested in finding reliable scoring to pair with ball-dependent players like Ben Simmons, Markelle Fultz and Joel Embiid. • 2005 – Portland trades No. 3 to Utah for No. 6, No. 27 and future first: This swap allowed the Jazz to move up and take Deron Williams, who was a pretty good player for the first few years of his career. The trade worked out extremely well for the Jazz, as the Blazers would go on to draft Martell Webster sixth and Linas Kleiza 26th. The 2006 pick wound up being No. 30 overall and was used on Joel Freeland, who played three seasons and averaged 3.2 points per game. • 1998 – Dallas trades No. 6 to Milwaukee for No. 9 and No. 19: The ninth pick wound up being Dirk Nowitzki — enough said. The Bucks wound up trading up to take Robert Traylor who had the nickname of tractor and passed away in 2011 from a heart attack. Pat Garrity was the 19th pick in the trade which has gone on to become one of the more one-sided trades in NBA history. As you can see, there have been mixed results. And with the Sixers still scratching their heads after moving up from No. 3 to No. 1 to take Fultz instead of Jason Tatum, there could be some bitterness or uneasiness still (depending on how Bryan Colangelo is feeling) amongst the prospect of moving up again. There are dozens of possible scenarios and more than a month ahead before the 2018 NBA Draft, but the thing we do know for sure is that the asset-rich Sixers are ready to cash in, and a move upward in this draft could be the contender's play this offseason.